The Silkworm is the tenth J.K. Rowling novel I’ve read. I believe that after ten often gargantuan novels I can make fairly accurate generalizations about her writing. And it saddens me to say that she keeps making the same mistakes. Most glaring is her treatment of female characters. In the Cormoran Strike mystery series, we have another female character of much greater intrigue shunted to the side in favor of a male protagonist, aka Hermione Granger Syndrome. Robin is Strike’s young personal assistant who could definitely contribute to mystery solving but mostly answers phones, schedules appointments, makes coffee, and provokes male gazing. The thing is, Robin is much more fascinating to me than Strike! Robin is desperate, unsure, diffident but ambitious—she would have been a fabulous heroine for a detective series about a woman trying to break into a traditionally male profession. Strike, on the other hand, does not interest me as a protagonist: he’s arrogant and infallible (sorta reminds you of a character whose name rhymes with Barry Lotter, non? ), meaning that whenever Strike eliminates a suspect from contention, I know him to be absolutely right, simply because J.K. Rowling writes Strike in a way that he is always right. For all of Rowling’s characterization skills, Strike is lacking. He has a cool backstory—missing leg, missing rockstar father—but none of it manifests itself in his psyche or quotidian actions. They are just things we know about him; like, oh hey, that’s Cormoran Strike, he lost his leg in Afghanistan and his dad is a famous guitarist. In general, I find J.K. Rowling’s characterization maddeningly brilliant. She’s super into the physicality of her characters. In The Silkworm the first few chapters serve no other purpose than to introduce the story’s players. But we are told who these people are, with special emphasis on their attractiveness and one-word descriptors: he’s the ambitious one and she’s the daffy one. Rowling is an expert at character portraits but you can only know the characters on her unique terms; there’s no room for personal interpretation. It’s as if she is this master dollmaker. Each character is impeccably painted, you can admire the surface details for hours, but if you cracked the dolls open, they’d be hollow. Nothing murks beneath the detailed yet limited picture Rowling has painted us. And yet, she’s a magnificent plotter, a skill really well-suited to the mystery genre which gives me hope for any subsequent installments (though I will perpetually groan about Strike’s usurpation of the protagonist role in lieu of Robin). She carefully charts her reveals and includes tons of clever but useless information to throw you off. I’m not the biggest fan of how she writes climaxes—this isn’t participatory mystery where you can solve alongside the detective; you must wait for Mind-Numbingly Boring Detective Genius Cormoran Strike to figure it out and share his conclusions with you—but the underlying plot structure is solid. I’d just love to see her combine this knack for plot with deepened characters and themes. Otherwise, it’s forgettable. 1. It is not Harry Potter. 2. It is not Harry Potter. 3. It is not Harry Potter. 4. It is quite excellent. 5. It is not Harry Potter. 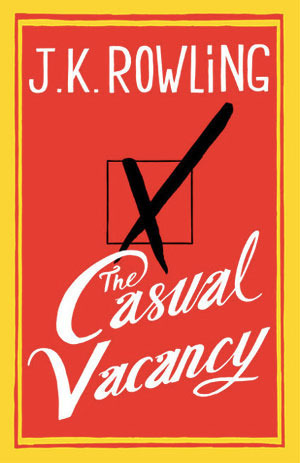 The Casual Vacancy is all about the characters. Such wonderful, devastating characters. There are probably 20 plus important characters in the novel and the remarkable thing? It is not only names that differentiate them; each person is distinct. Few authors can properly characterize a cast of three, and J.K. Rowling just characterized every inhabitant in the entire town of Pagford. The characters are all dissimilar and distinguished by various motivations, histories, and personalities. And yet, they’re all tragically alike—consumed by the same anxieties and searching for same validation. The characters are so believably human that you can’t easily lionize and sympathize with them but you unquestionably do since they are so real. Do you root for them all or do you pity them all? It’s an ambiguous narrative. In fact, JKR’s style reminded me of Balzac’s trademark style: realistic with characters that are neither good nor evil but simply human. Obviously, that’s a large departure from the Harry Potter series where the fight between good and evil, Harry and Voldemort, is established from page one. But this Balzacien style suits her. It’s almost as if JKR goes, “So here is this town, there is a death, here are the citizens, let us watch what happens.” Her detached narrator merely notes the happenings of these peoples’ lives for the sake of public record. Despite the extreme realism, the story still progresses in shocking ways. I had to stop reading occasionally—especially in the final 100 pages or so where the tightening and intertwining strings that connect the citizens of Pagford snap—because I was so surprised by what just happened. Most people who disliked the book complain about the lack of plot, but trust me, there is a plot here; it’s just more subtle than defeating a Dark Lord. The Casual Vacancy was unfairly panned upon its release. Yes, it’s nothing like Harry Potter but that’s why it’s fantastic. It’s about how we see people and we think we know them but we don’t. It’s about how people see us and think they know us and they don’t. As much as we love Harry, we all know how escapist his story was, right? The true horrors reside here, in our world.